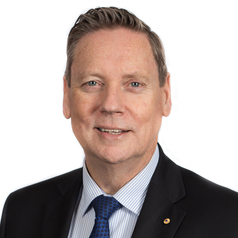 Geoff Masters is Chief Executive of the Australian Council for Educational Research (ACER). In this role he maintains his professional interest in educational assessment and school improvement, and has been invited to undertake numerous reviews for governments. His recent works include Reforming Educational Assessment (http://research.acer.edu.au/aer/12/), the National School Improvement Tool (http://research.acer.edu.au/tll_misc/18/) and Five Challenges in Australian School Education (http://research.acer.edu.au/policyinsights/5/). Professor Masters is an Adjunct Professor in the Queensland Brain Institute, University of Queensland, and has served on a range of bodies, including terms as founding President of the Asia-Pacific Educational Research Association; President of the Australian College of Educators; Chair of the Technical Advisory Committee for the International Association for the Evaluation of Educational Achievement (IEA); Chair of the Technical Advisory Group for the OECD’s Programme for International Student Assessment (PISA); member of the Business Council of Australia’s Education, Skills and Innovation Taskforce; member of the Australian National Commission for UNESCO (and Chair of the Commission’s Education Network); and member of the International Baccalaureate Research Committee.